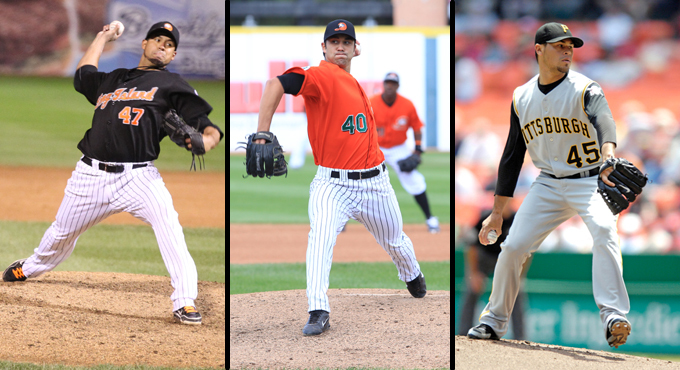 (Central Islip, N.Y., March 25, 2013) – The Atlantic League champion Long Island Ducks today announced the signings of pitchers Leo Rosales, Matt Way and Ian Snell to the 2013 roster. Rosales, a former Major Leaguer, and Way return for their second season on Long Island while Snell, another MLB vet, enters his first season with the Ducks. Rosales was acquired by the Ducks on September 18, 2012 in a trade with the Camden Riversharks for OF Reid Gorecki, and the righty made an immediate impact. After three scoreless innings to close the season, he tied a franchise record by earning the save in all three Ducks victories in the Liberty Division Championship Series win over the Southern Maryland Blue Crabs. The Los Angeles native also threw two innings during the Atlantic League Championship Series, earning the win in the decisive Game Five. Prior to joining the Ducks, he posted a 3-2 record with a 1.52 ERA and five saves with Camden. The 31-year-old spent three seasons as a member of the Arizona Diamondbacks (2008-10) and compiled a 5-2 record with 61 strikeouts in 76 games. He has nine seasons of professional baseball experience and a career minor league record of 36-22 with a 2.72 ERA and 88 saves in 352 games. Rosales was originally drafted by the San Diego Padres in the 20th round of the 2003 amateur draft. Way, who spent time with the Diamondbacks during 2013 spring training, joined the Ducks on September 16, 2012 in a trade with the Laredo Lemurs of the American Association. In two regular season starts, the southpaw threw 13 and one-third scoreless innings while striking out 19 batters in that span. He followed that by earning two wins and posting a 2.87 ERA in four playoff games (two starts), collecting 18 strikeouts in 15 and two-thirds innings. With Laredo, the southpaw went 10-7 with a 3.99 ERA and 112 punch-outs in 21 games (20 starts). The Alaska native has played three seasons of professional baseball including two in the Philadelphia Phillies organization. In those two seasons, he combined to go 13-9 with a 3.22 ERA and 170 strikeouts in 31 games (30 starts). The Washington State University alum was originally drafted by the Phillies in the fifth round of the 2009 amateur draft. Snell comes to Long Island with seven seasons of Major League experience, spending time with the Pittsburgh Pirates (2004-09) and Seattle Mariners (2009-10). In 152 career games (136 starts), the right-hander has a 4.80 ERA, two complete games and 639 strikeouts in just over 800 innings of work. His best season came in 2007 with the Pirates when he compiled a 3.76 ERA and a career-high 177 strikeouts in 32 starts. The 31-year-old has spent nine seasons in the minor leagues and has an sparkling career record of 64-27 with a 3.24 ERA, eight complete games, five shutouts and 721 strikeouts in 132 games (124 starts). A native of Delaware, he was named the Pirates organizational Pitcher of the Year in 2003 and threw a no-hitter as a member of the Indianapolis Indians (AAA, Pirates) in 2005. Snell was originally drafted by the Pirates in the 26th round of the 2000 amateur draft. The Long Island Ducks are members of the Atlantic League of Professional Baseball and play their home games at Bethpage Ballpark. Opening Day is April 26. For further information, call (631) 940-DUCK or visit www.liducks.com.